"Strange juxtapositions also characterize the paintings of professional artist Yu, Xuemin (b. 1963, Lhasa, Tibet). 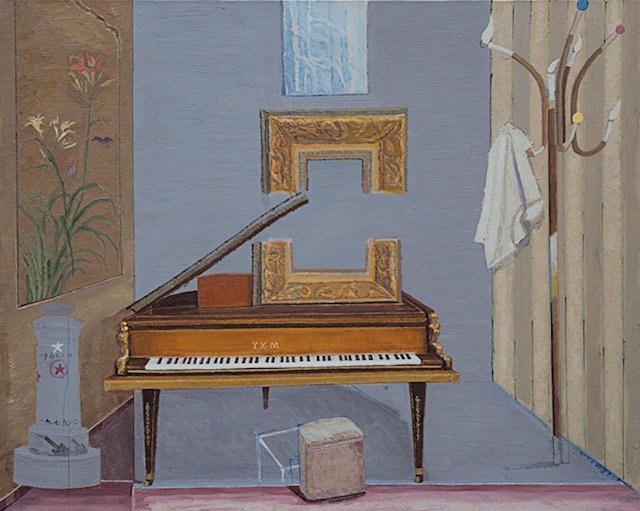 In Broken Mirror 1 and 2, the scenes are divided into three sections and are painted as if angled like a trifold screen or mirror. Yu describes the series as a “contemporary fable” which addresses “how to reconstruct the relationship between man and nature, between man and society, between man and himself in an age when…images are distorted by tampering.” Like Yang’s work, the naturalistic forms are recognizable, but the juxtaposition of objects and the rendering is unexpected and distorted. In Broken Mirror I, the three sections initially seem interrelated. Faded red containers sit atop or behind a rusty coal or gravel hopper on wheels, their warm colors complemented by the cool gray-blue-green sky and ground. The scene continues in gray scale into the right panel of the canvas, while the left section features the dark branches of a leafless tree and a traditional-styled building with an upturned roof angled against a sunrise or sunset. Instead of a scene, however, this panel appears to be a picture on a wall or board propped up by two yellow table legs. The contrasts and blending of gray scale and color and the manmade and natural suggest the uneasy relationship between nature and industry, reality and artifice."